The Seattle retail giant posted a profit of $3.27 a share during the first quarter of the year, from $1.48 a share a year ago. Shares climbed in after-hours trading. Amazon got off to a roaring start in 2018, easily surpassing analyst expectations for profitability during the first quarter of the year. The Seattle retail giant on Thursday reported a profit of $3.27 a share during the three months ended in March, up from $1.48 a share a year ago. Analysts had expected a profit of $1.25 a share. Amazon’s shares surged into record territory in after-hours trading Thursday, climbing 6.7 percent to $1,620. Investors have bid the company’s stock to new highs this year, making Chief Executive Jeff Bezos the world’s richest man, as a company famous for slim profits started stacking up some real cash. Net income during the quarter more than doubled from a year ago — to $1.6 billion, just shy of the record $1.9 billion haul taken in during the 2017 holiday shopping season. Driving that profitability was Amazon’s expansion into lines of business that have proven more lucrative than the company’s e-commerce core. For years, Amazon’s profit was driven almost entirely by how efficiently the company was able to buy goods, store them in its own warehouses, and sell them on Amazon.com, and by the pace of the company’s investment to grow that business. These days, Amazon has other levers to pull. Amazon’s range of other businesses — including cloud computing, sales of web listings and logistical services to other merchants, and the Prime subscription program — accounted for 47 percent of Amazon’s sales during the most recent quarter, up from 31 percent during the same period in 2016. The Amazon Web Services unit, which dominates the emerging market of renting computing infrastructure to companies, continued to be Amazon’s most profitable business. Sales grew 49 percent to $5.4 billion, and operating income came in at a record $1.4 billion. Big businesses are moving larger chunks of their technology infrastructure to AWS, Brian Oslavsky, Amazon’s chief financial officer, said during a conference call with reporters. “It’s happening on a faster pace,” he said. The fees Amazon charges other businesses to sell their goods on its site or use Amazon’s logistics hubs totaled $9.2 billion, up 44 percent. Subscription services, including Prime, grew 60 percent, to $3.1 billion. Amazon’s advertising division, which caught the eye of Wall Street analysts in the last year as it became a multibillion dollar business, also surged. Amazon’s catchall “other” revenue category — thought to be dominated by advertising sales — brought in $2 billion during the quarter, up from $850 million a year earlier. Advertising growth was a “strong contributor” to the company’s overall profitability, Oslavsky said. Oslavsky on Thursday also disclosed a surprise 20 percent increase in the cost of Prime memberships in the U.S., the first hike since 2014. The subscription program, which grants access to quicker shipping on many items as well as access to Amazon’s trove of streaming video content, will cost $119 a year for new members beginning May 11. Existing members will be charged the higher rate on renewals beginning in June. 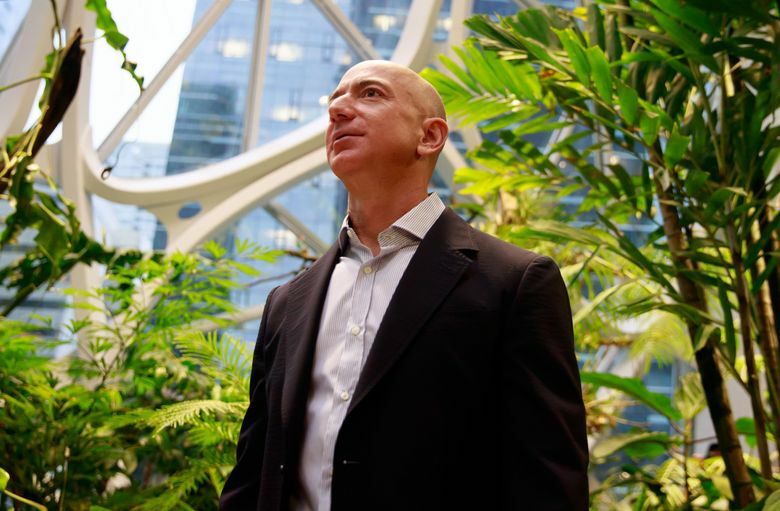 In a letter to shareholders last week, Bezos disclosed that the program had more than 100 million paying members globally. Amazon says its investment in the program has surged, including a warehouse construction spree to get goods closer to consumers and billions of dollars in spending on video content for Prime members. Analysts with Wedbush Securities estimate that the company will spend $6 billion on video content this year. Overall, sales during the most recent quarter came in at $51 billion. That included about $4 billion contributed by Whole Foods Market stores that Amazon didn’t own a year ago. Analysts had anticipated revenue of $49.9 billion, according to S&P Global Market Intelligence.